Reader(s), I’m going to try to be more honest in 2011. I’m going to try to be more diligent, too, particularly as it pertains to this blog, while simultaneously somehow figuring out a way to weigh less while drinking as many cocktails as ever. So, regarding that honesty promise, here goes: I like this Cosmopolitan. Note that I didn’t just say any Cosmopolitan. I like -- OK, total honesty; love -- this Cosmopolitan, which I based on the two I’ve had at The Matchbox in Chicago, the best sliver of bar in the world, a most perfect upscale-dive hybrid where grown, grizzled men often sip gimlets from V-bowled martini vessels. The Royale, where I tended in St. Louis, was hugely inspired by Matchbox, which was doing the fresh-juices thing eons ago and the raw-egg thing probably just as long. I used to make this Cosmo for a few of my regulars when I could do so relatively unnoticed, because I didn’t want to get any guff for serving raw egg white to customers and because I didn’t want every looky-loo at the bar asking for one (aka, the dreaded Mint Julep Effect). Even when I make it for myself at my leisure, I find the machinations of the World’s Greatest Cosmopolitan painstaking. My prep usually entails getting the non-alcoholic ingredients ready in little ramekins or finger bowls like they do on cooking shows, sifting the sugar (which I put on a saucer), juicing the lime and separating the egg white beforehand. Otherwise I wind up in the weeds halfway through my recipe. 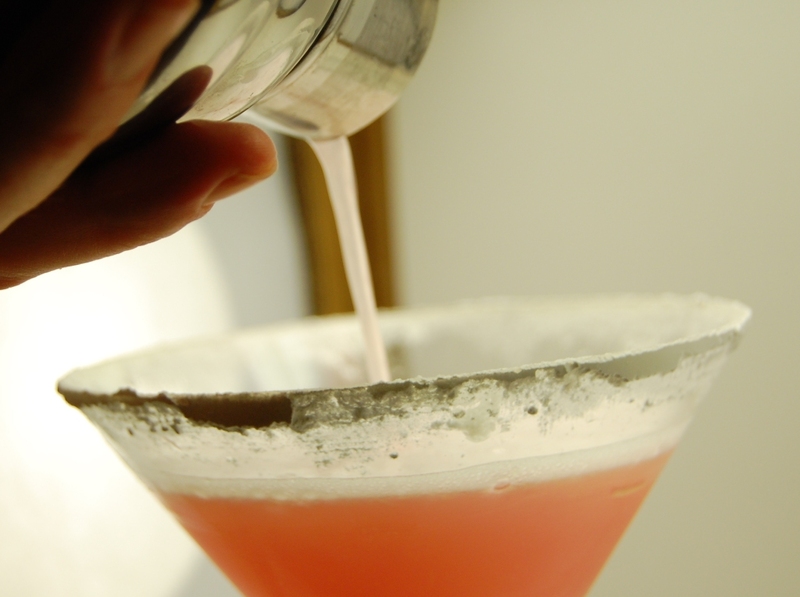 As for the bald fact that this is a Cosmo being discussed on a cocktail blog that claims to take its subject seriously, many of you know that pre-Prohibition-style cocktail lounges don’t serve vodka because Americans didn’t really drink vodka back then. You also know this if you watch Mad Men, which often references vodka’s mid-1960s, James Bond-cool surfacing. Then there’s vodka’s modern-day rep as a cheap, flavorless vehicle for getting inebriated for the sake of it, usually on a Cosmo or some diabet-tini knockoff thereof. Although I’ve already popped my vodka cherry on this blog, the spirit has never been my first, second or third choice for what to drink (bourbon, bourbon, wine) and it’s rarely been my fourth, either (“other,” or another bourbon, please, or else yes, I’d love a Moscow Mule or a dirty vodka martini up). I make no apologies for liking vodka a somewhere-in-the-middle amount. There are no small parts, only drunk assholes. Don’t hate the potion; hate the game. For the at-home bartender, vodka is inexpensive and fun to play with. And for the cocktail enthusiast, the World’s Greatest Cosmopolitan will delight and flabbergast your discerning palate. 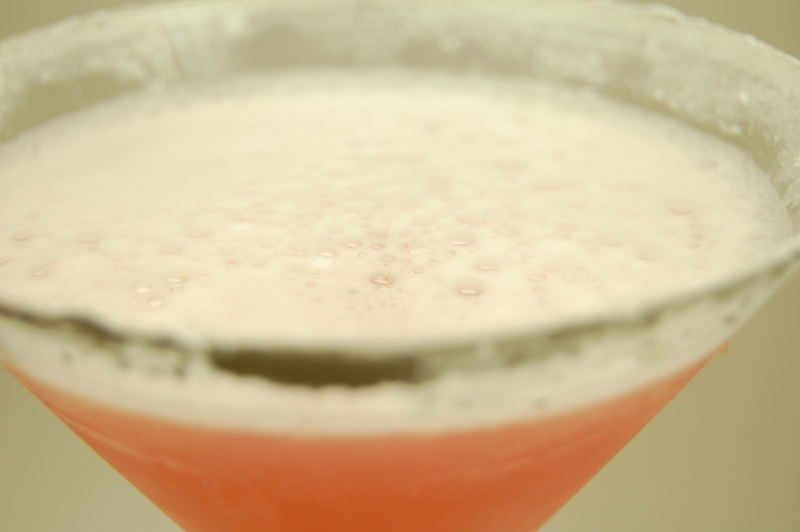 This Cosmopolitan is more smooth than tart, the egg white nicely rounding out the flavors of the fruit juices. Belying its history as a drunk-chick enabler, this Cosmopolitan demands to be quaffed slowly and pensively. 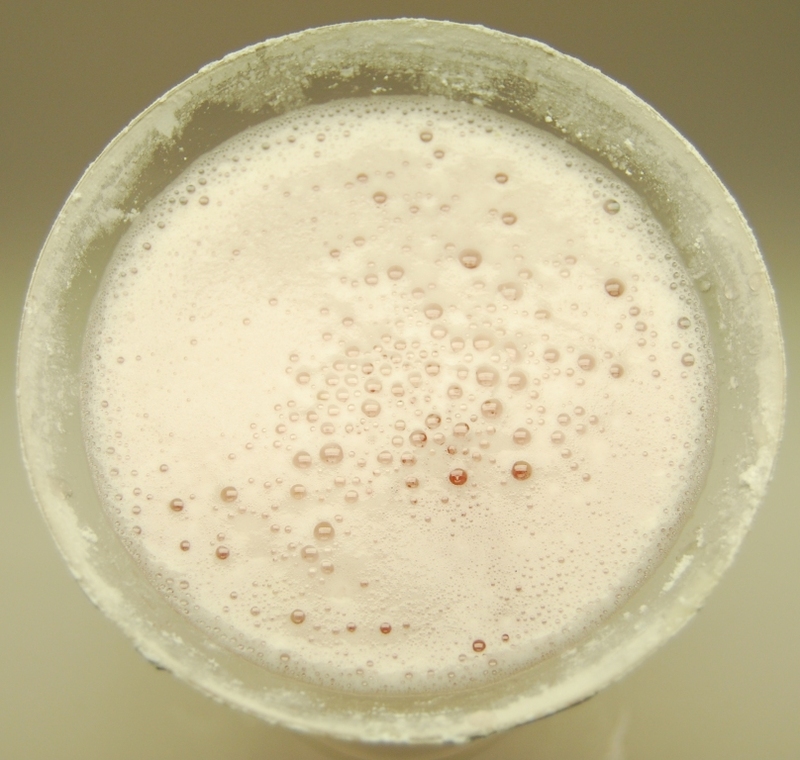 Its powdered-sugar rim, which I find to be its most fascinating component, likewise works to mellow out the harsh of the vodka-cran combo while necessitating tiny, measured hits of glass to lips -- which means you should be just about ready for your next drink by 5 p.m. tomorrow. Rim your cocktail glass with confectioner's sugar and set aside. Pour vodka, Cointreau and egg white into an empty cocktail shaker. Cap the shaker and shake with as much vigor as you can muster for at least 30 seconds; 60 is better. Add fruit juices to shaker. Fill shaker with ice. Re-cap shaker and shake again for another 20 to 30 seconds. Strain into your cocktail glass. Any medium-shelf vodka will do, although I do recommend Ketel One for the job. Go for Grey Goose if you're feeling fancy. For glassware, I use my Riedel martini glasses, which have a thin rim that takes on the confectioner's sugar in good proportion. 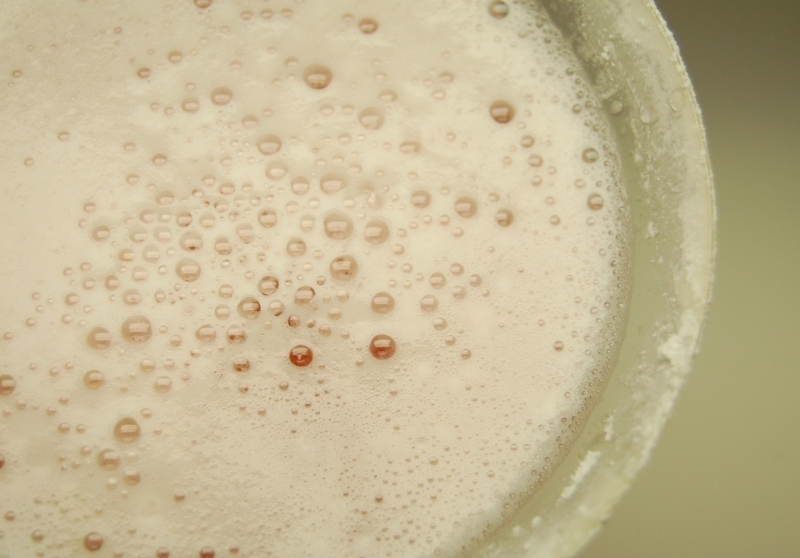 I once read (I think in either Imbibe or Drinks) that it's better to shake egg whites without ice, or at least to do a preliminary shake without ice. Something about the way the ice prohibits the viscous egg white from mixing well. How vigorously do I mean when I say shake vigorously? This guy knows what's up.